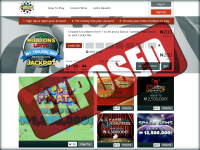 Is Afro Millions Lotto a Scam or Legit? Read Reviews! Bonus: Get 3 Tickets Free! Wanna be a billionaire. Well, we are talking Nigerian Naira. That’s the starting jackpot at AfroMillionsLotto.com. This is an online betting site that uses the official German National Lottery for the results for their game. New players get 3 free tickets – well that’s what the pop-up window offers. There are also a bunch of scratchies with my personal favorite Pop Up Pinata. Afro Millions Lotto bases their draws on the German National Lottery. Players choose their ticket lines from 1 to 49 with a bonus number of 0 to 9. This takes place at 6:25 pm CET on Wednesdays and 7:25 pm on Saturdays. You’ll be notified of any win by email and in most cases (unless we’re talking a jackpot) have access to use your funds within one hour of the draw. For Afromillionslotto.com’s scratchies, players have a choice to play for free. What is a little suspicious is I won every time. Can’t imagine that would happen when playing with real money. As of April 2018, Afro Millions Lotto offers the value of three free tickets when you deposit ₦1600 to your new account. This is only available for new players. This credit can be used for purchasing lotto tickets, scratchies or to play Afro5Live (on one of their other sites). This is betting with the jackpot starting at ₦1,000,000,000 (estimated USD 2,751,960). ₦ means Naira which is the official currency of Nigeria. It increases each draw by ₦100,000,000 until the jackpot is won – to a maximum of ₦2,000,000,000. There are five other tier levels starting from matching 6 numbers and win ₦100,000,000 down to match 2 numbers and win ₦100 (27.5 US cents). Winnings at ₦10,000 can be transferred to your debit card or wallet (weird that one). To get your winnings transferred to your bank account, you need to reach the threshold of ₦25,000 to ₦500,000. Over ₦500,000 you need to provide a photo identification and documentation. As larger (no definition for this) winnings are paid by AfroMillionsLotto’s insurer, they say it can take up to 30 days. Players have 180 days to claim their winnings. They say there is no fees and commission on winnings though third-party charges might occur. The only restriction on playing at this site seems to be your legal age – 18 years or older – and you can legally play where you reside. Unlike other sites, you can also have as many accounts as you’d like. This one is a little confusing. AfroMillionsLotto is run out of a company registered in Curaçao but registered as a public company in the UK and trades shares on the Dutch Caribbean Securities Exchange. But all winnings are in Nigerian currency. There are a snail mail and email address. Their phone number is UK based. There is also Skype and Live Chat though limited to 9:00 am to 9:00 pm Monday to Saturday, and 12:00 noon to 7:00 pm Sunday CET. Well, I’m not actually sure when the Live Chat works as it kept coming up with a “leave a message”. Ofertas365 who runs AfroMillionsLotto.com launched their lottery in Nigeria to raise money “for football clubs and charities in emerging markets” though it doesn’t say how much actually goes to these things. Would you mind rating AfroMillionsLotto.com? I’m still trying to get my head around the different registration aspects of this online lottery betting site. The other issue to me is if you are going to set up a lottery to support charities and sports, why wouldn’t you be clear on how much goes to this. Most of the other guys do. AfroMillionsLotto.com gets a thumb’s down for now. It’s a fairly new site (August 2017) so it will be interesting to see what they actually do donate to football and charities.